Lucky Last Video Slot Guide & Review - Casino Answers! Lucky Last is a 5-reel, 25-line video slot developed by Realtime Gaming. It has scatter wins, wild substitutes, two progressive jackpots and a free games feature. 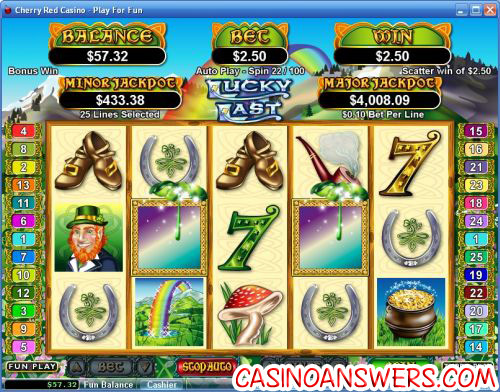 You can play Lucky Last at USA-friendly casinos Aladdin’s Gold Casino and Rushmore Casino. Bets on Lucky Last are $0.01, $0.02, $0.03, $0.04, $0.05, $0.06, $0.07, $0.08, $0.09, $0.10, $0.25, $0.50, $1, $2.50 and $5 per line. You can play up to 25 lines at a time. The minimum bet is $0.01 on a single line or $0.25 on all lines. The maximum bet on the Lucky Last slot machine is $125. The top fixed jackpot on the Lucky Last video slot is 5000X your bet. To win 5000 coins from the leprechaun, you have to line up five leprechaun symbols in a row. The second largest fixed jackpot is the pot of gold at 2500X your bet. You can double these prizes if you complete them with a wild substitute coin symbol. Lucky Last’s wild symbol is the gold coin. It will only appear on the first and fifth reels. It will substitute for all of the symbols in the game except for the scattered shamrock symbol. The prize is doubled if one or more coin symbols appear in a winning combination. The wild symbol can also trigger the Lucky Last free spins feature. Seven free spins will be awarded when one or more coins appear on both reels 1 and 5. This can only be re-triggered on the last spin of the free game series. The last free spin has a 50% chance of re-triggering the feature. Any re-trigger on the seventh game starts a new series of seven games. All prizes are tripled in the first six games of the series and doubled on the final spin. The Lucky Last feature can re-trigger a maximum of five times. Free games are played at the lines and bet of the triggering spin. Lucky Last has two progressive jackpots – Minor (starts at $250) and Major (starts at $1000). These jackpots can be won on any spin you make. They are triggered at random. You will increase your chances of winning a progressive jackpot on the Lucky Last slot by betting higher. You can play for the Lucky Last jackpots at Aladdin’s Gold Casino! The Lucky Last slot machine has an autoplay feature. You can set your number of spins (5, 10, 25, 50, 100, 250, 500 or 100), to stop when the jackpot is won, to stop if a win exceeds or equals any value you enter, to stop on any win, to stop if your balance increases by any value you enter, to stop if your balance decreases by any value you enter and to stop once the free spins feature is triggered. You can stop the autoplay mode at any time. Lucky Last is a fun slot machine, with an excellent free spins feature where you can win up to 35 free spins total and two progressive jackpots. Lucky Last is definitely a winner of a video slot, and if you get lucky, you’ll be a winner too! For an unlimited 200% signup bonus that you can clear while playing Lucky Last, visit Aladdin’s Gold Casino. Is the Lucky Last video slot playable by US players? Yes, American players can play Lucky Last and the rest of the great games from RTG at Aladdin’s Gold Casino. If you’re from outside the United States of America, you can play the Lucky Last online slot game at King Solomons Casino. Where can I find other Irish-themed slot machines? 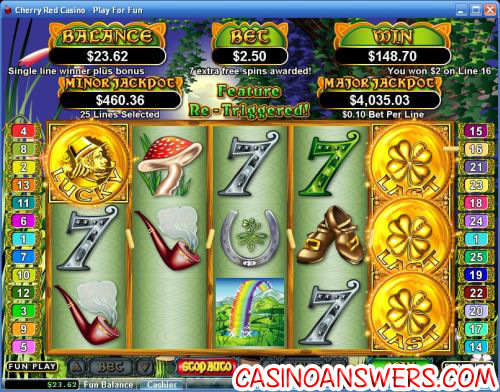 Due to the luck of the Irish, you can find a slot machine with an Irish theme at just about every online casino. Cryptologic has Emerald Isle at Casino Joy, Random Logic has Irish Eyes at Lucky Ace Casino, Playtech has Irish Luck at Titan Casino, Rival has Shamrock Isle at Paradise 8 Casino and Vegas Technology has Luck o’ the Irish at VIP Slots Casino. What irish slot machines are there? What lucky slot machines are there? I am feeling lucky what slot machine should I play?